RCampus is an Education Intelligence and Learning Management System developed by Reazon Systems, Inc. It provides access to a suite of innovative, web-based instant-access tools with community-based learning and collaboration environment. RCampus includes iRubric assessments and standards system, LMS, ePortfolio management system, Matrix outcomes system, Competency management system, eCommunities and more. Schools can use our Enterprise Edition with more modules and enhanced tools through various licensing and hosting options. Instructors and students covered under the Enterprise Edition also have access to more features not available in the Personal Edition. Our Personal and self-service edition is available for free for individual instructors and students with subscription options for Premium upgrades. Using our tightly integrated system, instructors and students can manage everything from a single location which is conducive to their teaching and learning experience. No multiple accounts, no multiple logins, no multiple passwords. RCampus.com: Designed for teachers and students, offers personal website and eportfolio builders as well as class management, online gradebook, and more. 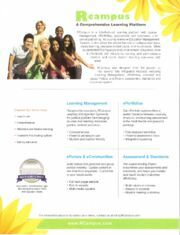 iRubric.com: iRubric with Click2Grade technology is a comprehensive web-based rubric building, assessment and outcome reporting, data analysis and accreditation system with an integrated collaborative assessment community. I just found out this web site looking for something else, but as an educator I found it so superb that I couldn't miss the opportunity of opening an account and obviously taking advantage of such a powerful tool. I LOVE this tool. Thank you!! I am a lead math teacher at my school. In the couple of days I have been a member, your site has saved me hours (days & months) of work and time. Finally, an educator's site which is both practical and user friendly. In essence, I work smarter - not harder! Thank you-again. I love your site! I've finally found a place where teachers can share information freely! After a lengthy stint on the internet looking for rubrics so that I didn't spend so much time reinventing the wheel, I finally discovered your site. What a Godsend! Thank you!!!! I absolutely love this site! It's nearing the end of the semester, but it helped my figure my grades: one less headache... Thanks, again, for this great site and for reducing my stress level. I teach English, and I dislike math and calculating grades. I've been using Yahoo groups to communicate with my students. Where have you been hiding all this time? You are like the safe version of MySpace. I can't get over how much functionality you packed in your website.